I’d like to say this years Melbourne Cup Carnival went off without a hitch, but mother nature certainly decided to let loose on Melbourne Cup day and show us race goers who’s the boss. Fortunately I managed to stay dry and made the most of time. 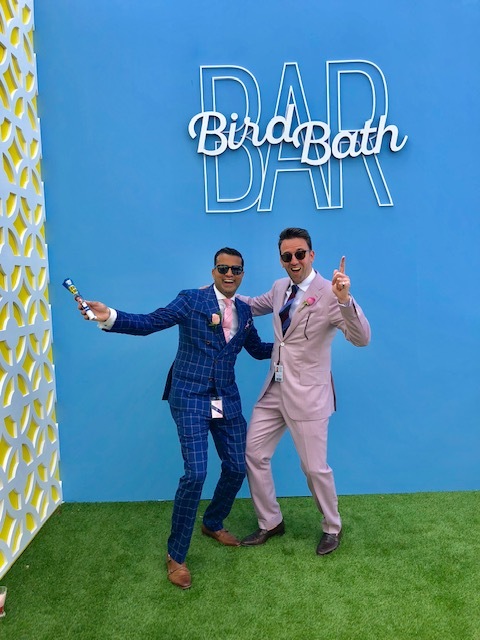 The rest of the carnival of was mostly perfect and the Victorian Racing Club and Flemington Race Course hosted one of the best ever carnivals to date, particularly with the launch of the new Member’s Pavilion. But of course what really caught my eye, was the amazing fashion. 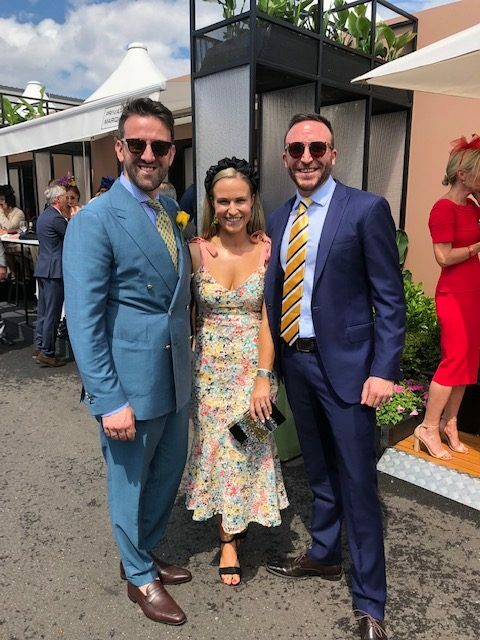 Men and women alike stepped out in force to show the rest of the country, alas the rest of the world that this little race that stops a nation, isn’t just about horse racing, its a serious fashion event. Here is a little breakdown of what I wore and what I saw. A sea of black and white, Derby Day is one of my favourite days. I love the tradition, I love the cornflower and I love how men try to bend the rules a little, just as I did. 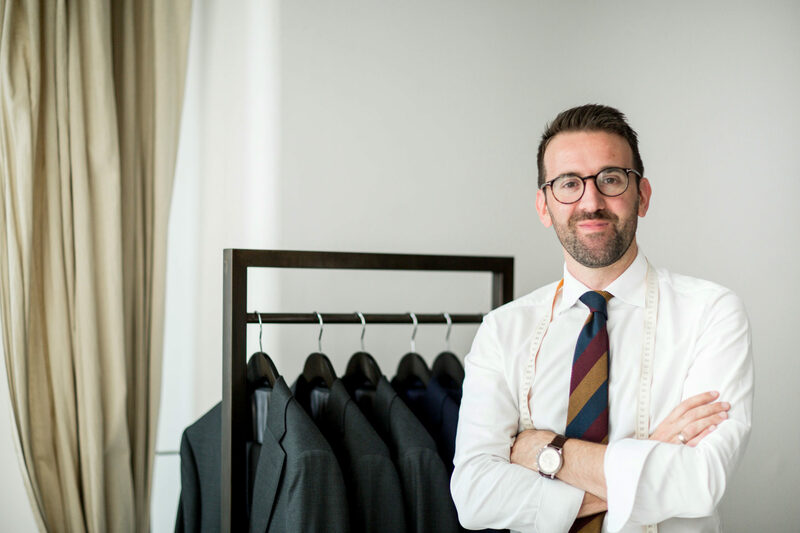 This year I opted for a light grey micro check three piece suit, with an exclusive wool/silk blend cloth from Lanificio Cerruti in Biella, Italy. Naturally I wore a white Oxford Shirt, with a black and white silk tie and black accessories. 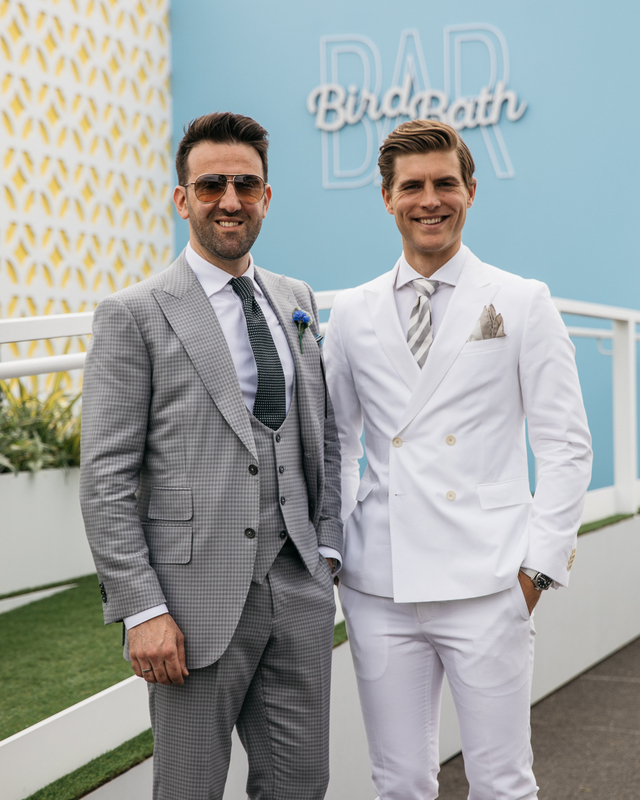 As for the men’s suit trends, shades of black and white were everywhere to be seen along with graphic patterns and even more the traditional morning suit attire, which I really loved. 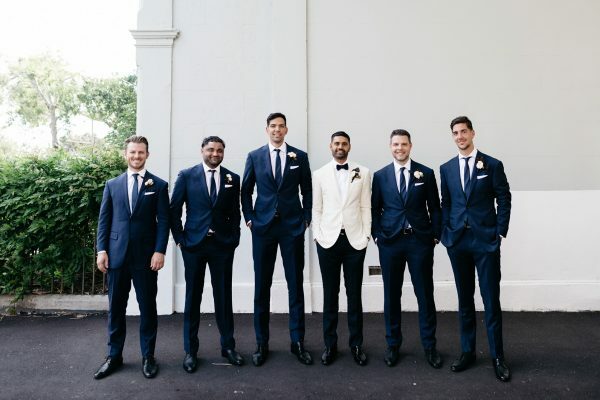 I also loved seeing more men wearing white. 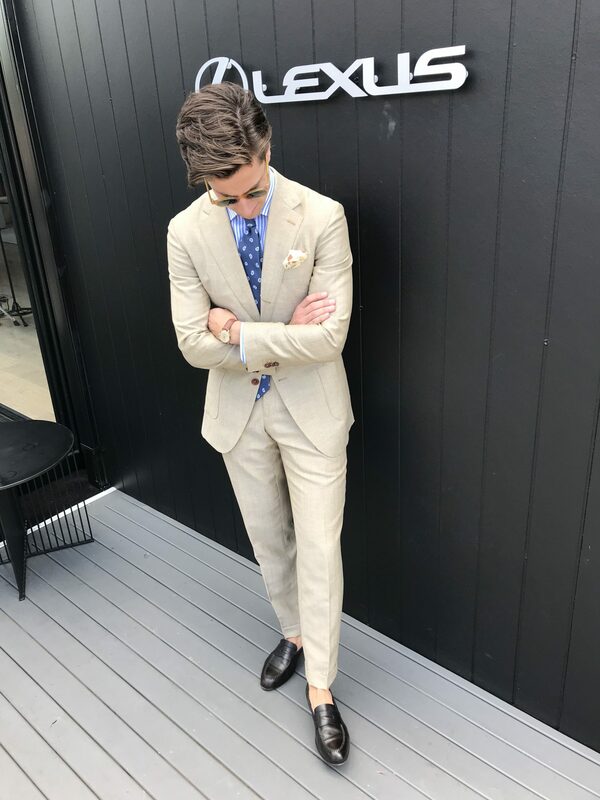 White suit, sports jackets and even white trousers finally proves that we get it, we are sophisticated and clean enough to wear white, just like the Italians. One thing I did not not love however, was the amount of dinner jacket and satin trimmed lapels I spotted on the concourse. Tuxedos have no place at the races, they should only worn at formal evening occasions. 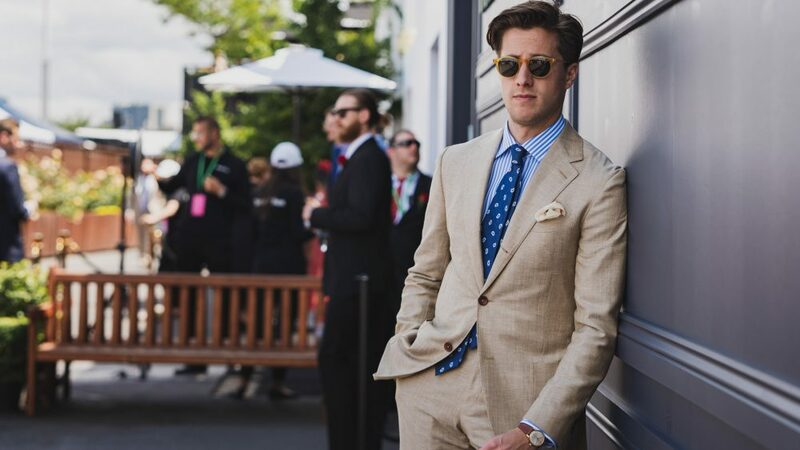 I made quite a few bespoke and made to measure suits this Spring Racing Carnival and even dressed a number of people for Melbourne Cup Day. Usually men like to play it safe and wear blue, but this year we saw strong colours, bold patterns, and even bigger personalities. Cup day is all about colour and fun, from soft pastels to earthy tones and even stronger hues of blue and maroon. I loved what I made and i loved what I saw. This year I wore a teal green double suit, which actually sounds more bold and 1990’s than it actually looked (I hope). The clots was a wool/mohair blend perfect for the warmer weather, even though it bucketed down for the whole morning, I remained dry and comfortable. A couple of my favourite looks this year, were suits which I made for clients and friends, I know I bias but I have to be. I love the royal blue window pane three pice suit I made for NBA superstar Corey “Homicide” Williams. 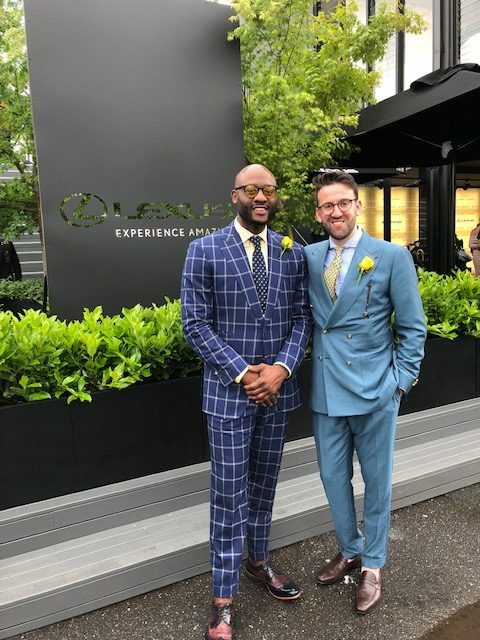 The bold check in the suit and the yellow and blue stripe shirt complimented the rose of the day and of course Corey’s cheeky grin and New York swagger nabbed everyones attention. 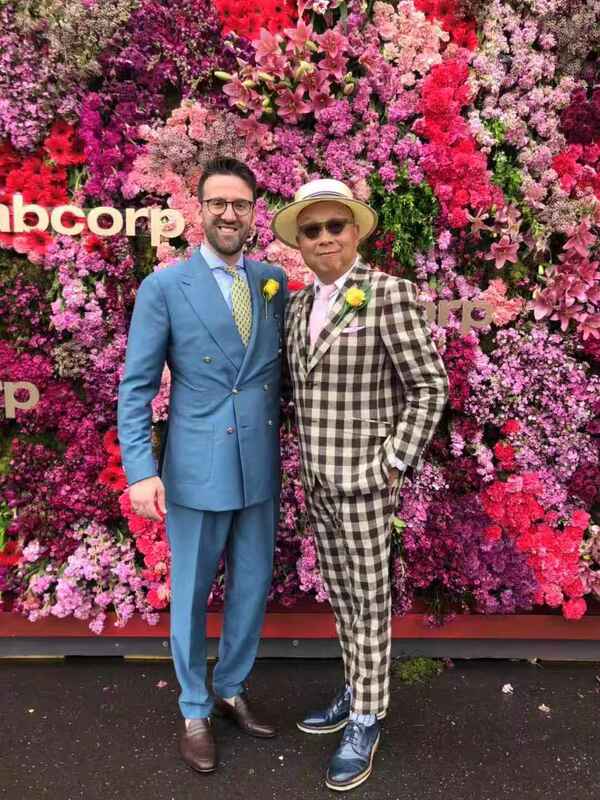 The other show pony of the day, my good friend and colleague, international man of mystery Jimmy Li, flew in from Shanghai to attend Melbourne Cup and wore a suit I had for him a few month prior. A gorgeous wool and alpaca blend in a brown and cream gingham check. 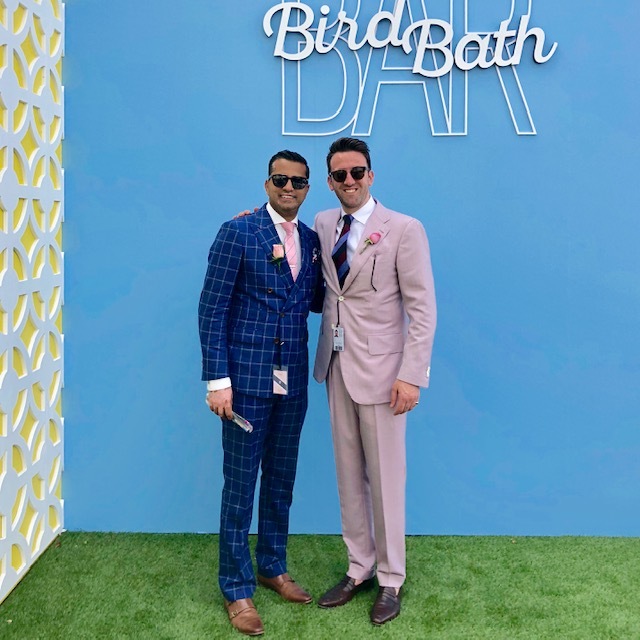 With some serious country inspired vibes Jimmy certainly proved that the three piece gingham number belonged in the city and track side for the matter. 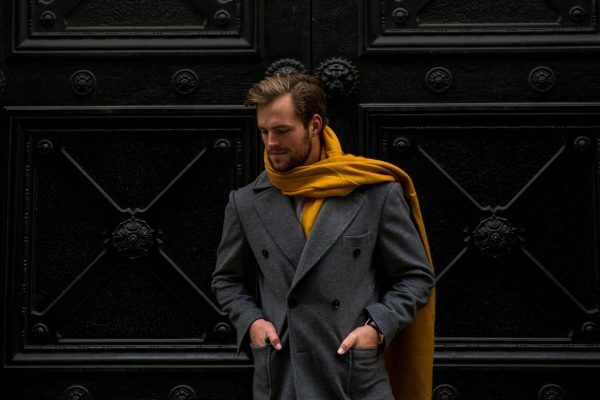 Even GQ Australia rated him as one of the best dressed men of the day. Possibly the most fun day of the races. Its not as busy, the weather was perfect and the attention was mostly on the women, so the guys could relax. But boy was it colourful. 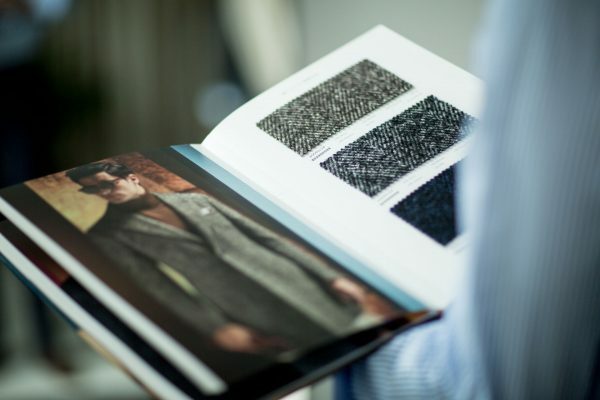 Many men opted for soft feminine tones, mismatched jacket and trouser combos or even classic corporate attire. It was clear some people were there to do business, others just looked like it. 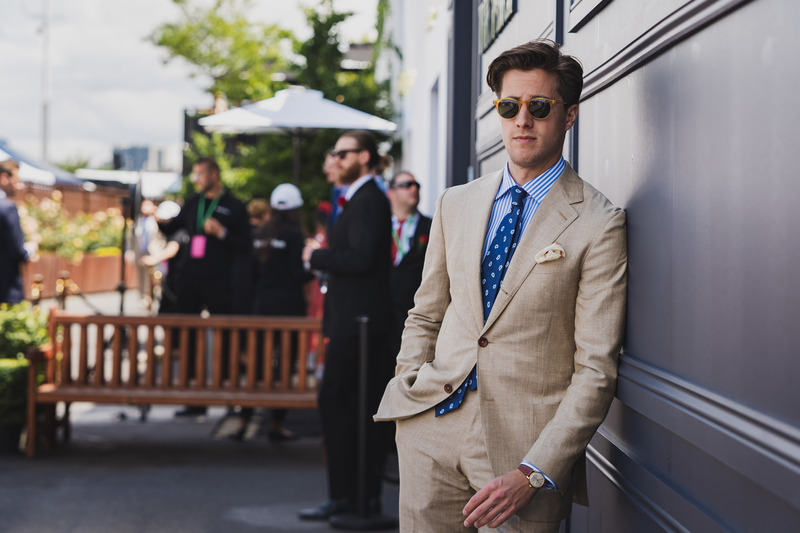 I wore a soft pale musk wool/linen/silk number with a two and half button (or a tre su due for your Italians out there) jacket with very soft Neapolitan shoulders and only a very light canvas construction for a more relaxed and summery feel. 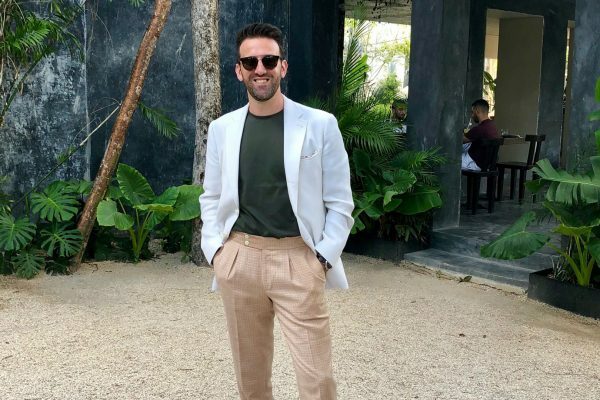 My trousers however, looked like something out of The Talented Mr Ripley, a little 1940’s inspired with a fuller leg and double pleated cut. Very soft and breezy finished with and a wide 5cm cuff. Now I didn’t get to go along to Stakes Day, I do have a business to run you know. But I did get to dress some very sharp looking men, one in particular. 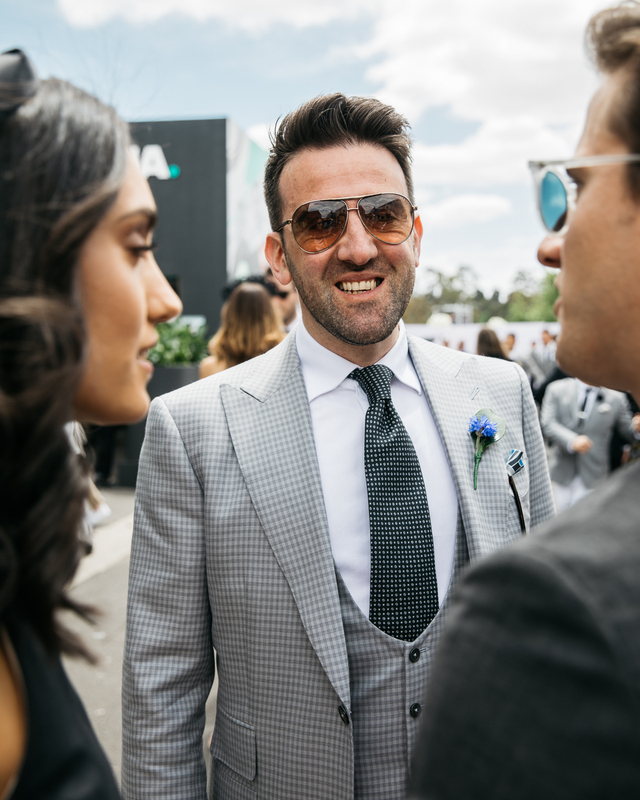 I am sure you will all agree that Mr Joshua Bozin, man about town, prominent GQ and Man of Style writer and general all round nice guy, looked pretty special in a wool linen herringbone made to measure two piece suit which I made especially for the Stakes Day. We wanted to achieve a relaxed yet elegant look, and I thought this light sand colour in a very subtle herringbone weave would do just that. The jacket was half lined with no shoulder padding and the softest of canvasses insert into the chest piece. This allowed for a very soft drape but a very comfortable fit. Josh wanted to look on point, but bold was not the order for the day. 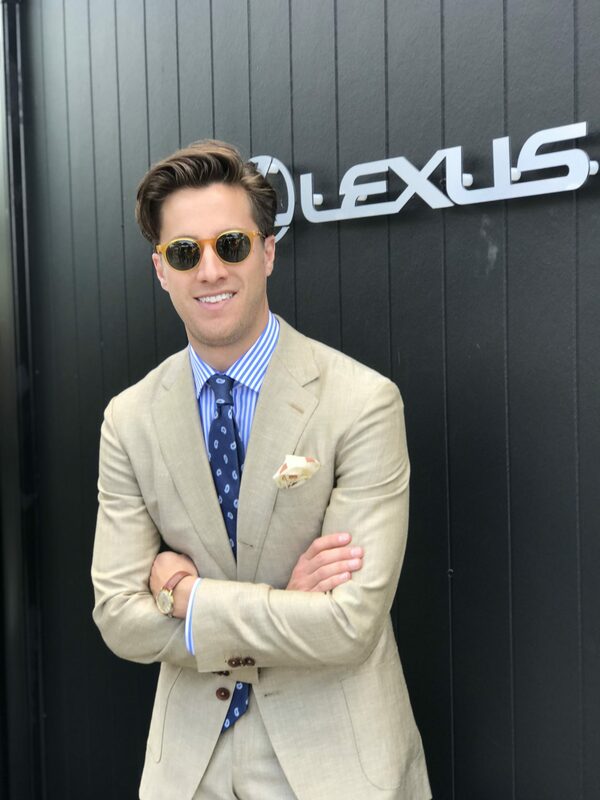 what was however, was a classic cut away collared shirt in a blue and white pinstripe poplin with a beautiful line paisley tie hand-made in Italy. I couldn’t have been happier with this look.